How Long Does It Take to Turn an Invention Into a Product? Inventors often ask how long it takes to turn an invention idea into a real product and begin making money. Of course it depends on the complexity of the product, the skills of the product developer, distribution channels, marketing, money and luck. Below is what the development process looked like for Joel Marks, a mechanically brilliant but totally inexperienced inventor working on his own with a limited budget. 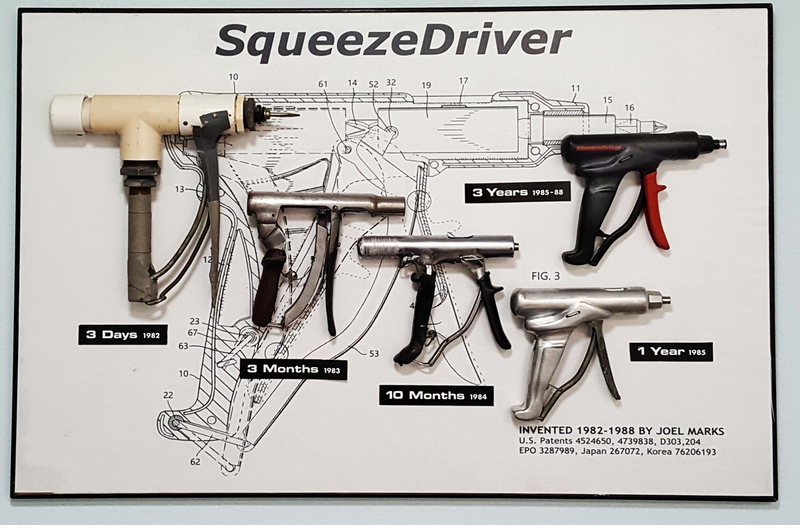 The product is the SqueezeDriver® rotary screwdriver. You can read about its (lack of) commercial success here. As you can see, the first prototype took just three days. Turning it into a manufactured product took Joel another five years. An experienced product development company like Invention City should be able to do a job like this, going from idea to manufactured product, in less than two years... but there's still no guarantee it'll make money. Getting paid takes time too. Bricks and mortar retailers and catalogs make buying decisions six months to one year in advance and can take 2-3 months (or longer) to pay. Royalty deals typically pay on money actually received in a previous calendar quarter. Put all of this together and it means that once manufacturing begins it can well take another 18 months or even longer for an inventor to begin seeing royalty income.